Before purchasing a car, it is a good idea to learn the typical auto repair costs for your area. Mechanical breakdowns always seem to happen at the most inconvenient times, and with the complex computerized systems often found in late model vehicles, it can cost you a lot of money just to have the problem diagnosed. And, once the issue has been identified, you are still looking at the cost of replacement parts and labor, which is often the most expensive part of any repair. The total expense depends on the make, model, and year of your car as well as labor costs, which can vary significantly from one area to the next. Some vehicles are more difficult to work on, some parts are more readily available, and some models are more costly to repair. Also, auto repair costs are generally higher for European vehicles than Domestic or Asian vehicles. Before leaving your vehicle at a dealership or shop, there are a few tips you can follow to make sure that you are getting the best price possible on major system repairs. Know the typical rates and prices. A little research can save you a lot of money. Find out what other people have paid for similar repairs, use the internet and other resources to learn the cost of replacement parts and the expected number of hours required to complete the job. Just because you are quoted a price does not necessarily mean it is set in stone. Many shops overcharge or have huge markups on parts because no one questions the quotes. If you are armed with accurate knowledge, you will have more negotiating power. Shop around. Prices can vary greatly between repair shops, and independent shops are often more reasonable than dealerships. Many places do not charge for estimates, so it doesn’t hurt to get several quotes. It may require some extra time, but the savings may be worth the effort. Even if you have to pay an initial diagnostics fee, you can use this information when contacting other shops. This may help them give you an accurate estimate, often over the phone. If you have any type of extended coverage, you will need to check with your provider about approved repair locations. Ask about the quality of parts. When getting quotes or estimates, be sure to ask if the price is based on aftermarket parts or ones made by the original manufacturer. This could make a difference towards auto repair costs, depending on the particular part, the age of your car, and your personal preference. In some cases, an aftermarket part can be of equal or better quality, but it can also be inferior. Again, if you know the typical costs, you will be able to make an educated decision and make sure that you are paying a fair price for the repairs. Request an estimate in writing. Make sure that the dealership or shop gives you a written quote listing the price of all needed parts, labor costs, diagnostic fees, and any miscellaneous expenses such as tire disposals, hazardous waste disposal, or shop supplies. Also, some repair shops charge flat rates for certain repairs and you will pay the full amount even if it takes less time to fix your car than indicated in the estimated cost. However, if your vehicle takes longer to repair than what is calculated in the flat rate, you will be expected to pay the extra. It is important that you are aware of these practices and that you ask if you will be charged based on a flat fee or hourly rate. Requesting an estimate in writing is not a guarantee, but at least you will have a good idea of the repair costs. And if the difference is significant, you have proof of the original quote when you argue the bill. You may also wish to ask the shop to contact you about any unexpected additional charges so you have the option of approving the costs before the work is completed. Auto repair costs car can be expensive, and at some point, everyone has to deal with this inconvenience. If you are not prepared, the expense can be financially stressful. Although auto repair costs can vary, there is a typical range that you can expect to pay when completing major system repairs on your vehicle. Transmissions are very complex, and repairs usually require that the transmission is removed, damaged parts replaced, and then reinstalled. Prices will vary depending on the exact nature of the repair, but the large amount of time needed for any transmission work will be noticed in the price. You can expect to pay between $1600 and $2,000 for domestic or Asian models, while European models will cost approximately $3,000-$3,500. 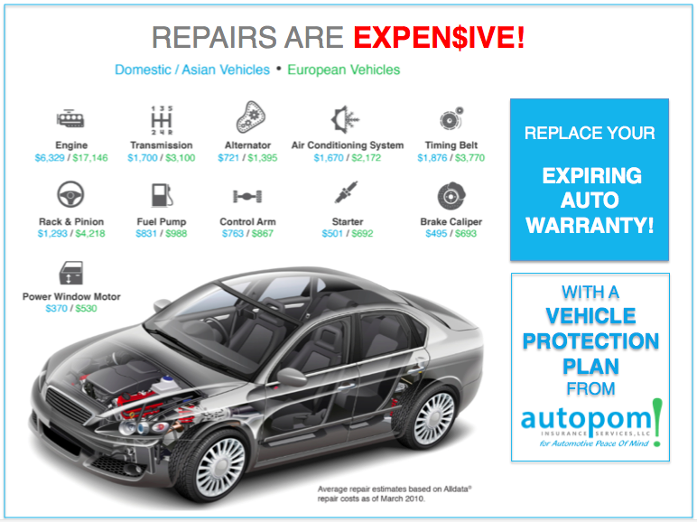 Rebuilding or replacing an engine is probably the most expensive auto repair costs for any vehicle. No matter what the issue, engine work is not cheap. Replacing a camshaft is about $1,000 for a domestic/Asian vehicle and as much as $3,000 for European models. A head gasket will typically cost between $1,200 and $1,500, while this repair on a European car could be more than $2,000. Even a smaller repair such as an intake manifold gasket can run about $400-$600, depending on the vehicle. And, if you need to replace the entire engine, you will be facing an expense of $6,000-$6,500 for domestic or Asian cars and as much as $17,000 or more for European models. Replacing a timing belt will cost approximately $1,800-$1,900 for a domestic/Asian vehicle and about $3,700 for a European model. You will have to spend between $700 and $1,400 for an alternator, and between $500 and $700 for a starter, depending on your particular car. The most common issue with the fuel system is the fuel pump which will cost about $800 for domestic/Asian cars, but closer to $1,000 for European models. You will need to spend between $600 and $800 for a replacement gas tank, depending on the make and model of your car. With everything from struts and shocks to differentials, the suspension and steering systems can be costly to repair. For example, a rack and pinion will cost about $1,300 for domestic/Asian models and more than $4,000 for European vehicles. A control arm will run between $750 and $900, while replacing a power steering pump will be approximately $400-$600, with this repair on European cars costing as much as twice this amount. Brakes are an important part of the car, so to avoid accidents you want to make sure that you deal with any issues immediately. A master cylinder can cost between $200 and $300, a brake caliper between $500 and $700, and ABS repairs can be as expensive as $1,200-$2,000, depending on the make, model, and year of your vehicle. With so many computerized and power operated features in today’s cars, even the simplest of problems can be costly to repair. A power window motor can cost between $400 and $550, and the various computer modules can be anywhere from $450 to thousands of dollars, depending on the make, model, and specific problem. Even the air conditioning system can add up to more than $1,600 for domestic/Asian models and $2,000+ for European cars. The inconvenience of a mechanical breakdown, as well as the unexpected auto repair costs, can be stressful. But, you can protect yourself against these unplanned expenses with a vehicle protection plan. Imagine the peace of mind knowing that you are covered for all major repairs with little disruption to your lifestyle. Many plans include roadside service, rental cars, and even hotel, food, and travel expenses if your vehicle breaks down while you are on vacation or away from home. You cannot control everything that happens in life, but with mechanical breakdown insurance, you will have one less problem to worry about.